Around 40% of the world population has an internet connection today and I am sure this number will not stop there. 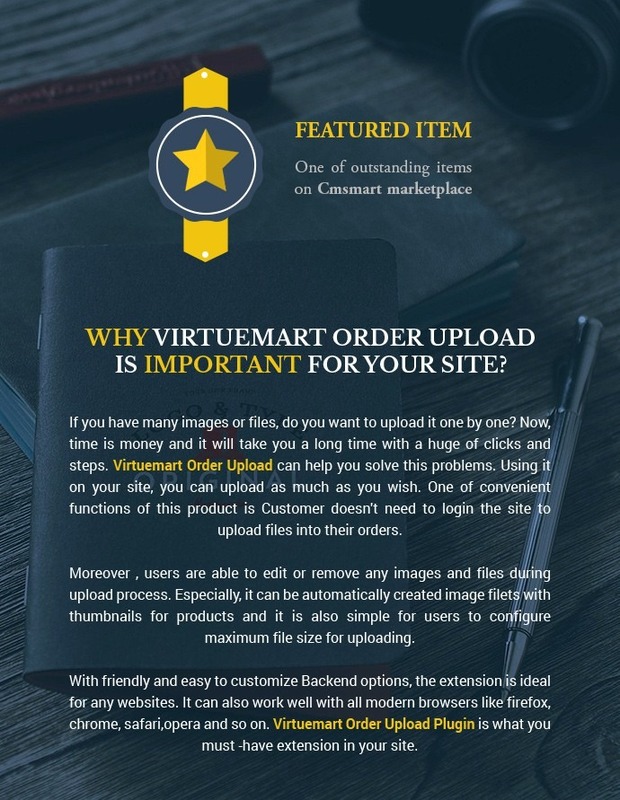 Today, people contact via many devices with a lot of ways to save time and if you own an online store, you cannot miss Virtuemart Order Upload Plugin on your website. Order Upload Extension is easy to use and install for shop owner with medium and small business size. And shop owners don't need to worry about broken of Virtuemart hacks. If you have many images or files, do you want to upload it one by one? Now, time is money and it will take you a long time with a huge of clicks and steps. Virtuemart Order Upload can help you solve this problem. Using it on your site, you can upload as much as you wish. One of convenient functions of this product is Customer doesn't need to login the site to upload files into their orders. 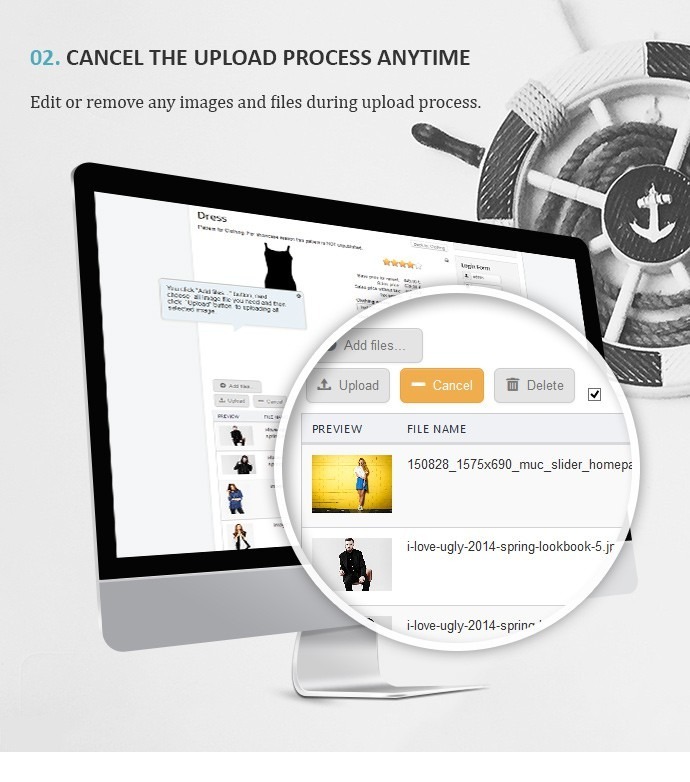 Moreover, users are able to edit or remove any images and files during upload process. 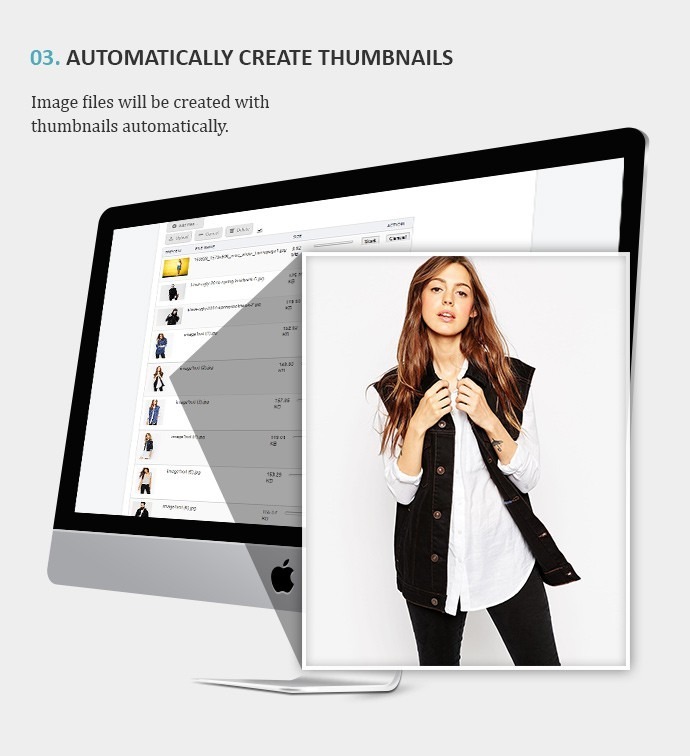 Especially, it can be automatically created image files with thumbnails for products and it is also simple for users to configure maximum file size for uploading. With friendly and easy to customize Backend options, the extension is ideal for any websites. It can also work well with all modern browsers like Firefox, chrome, Safari, Opera and so on. 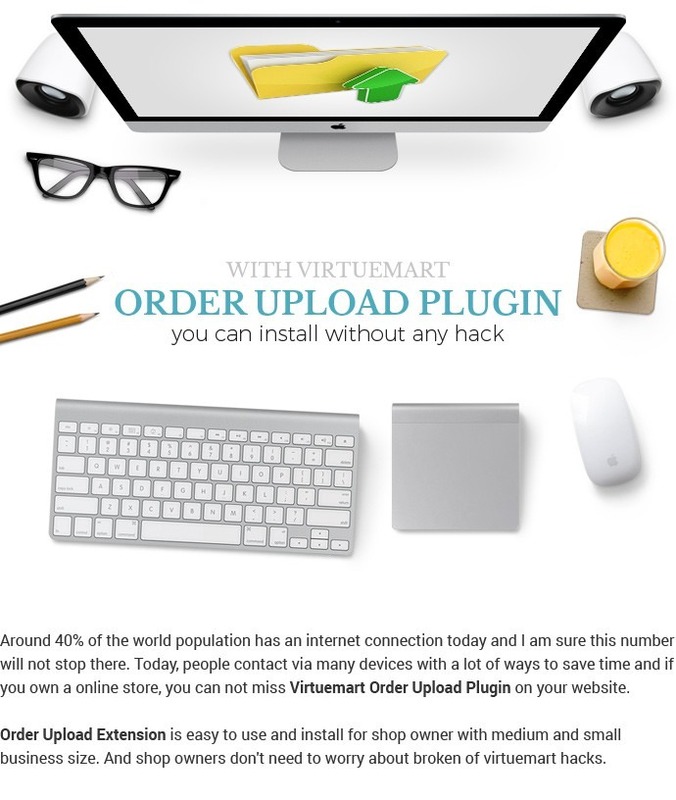 Virtuemart Order Upload Plugin is what you must -have extension in your site. 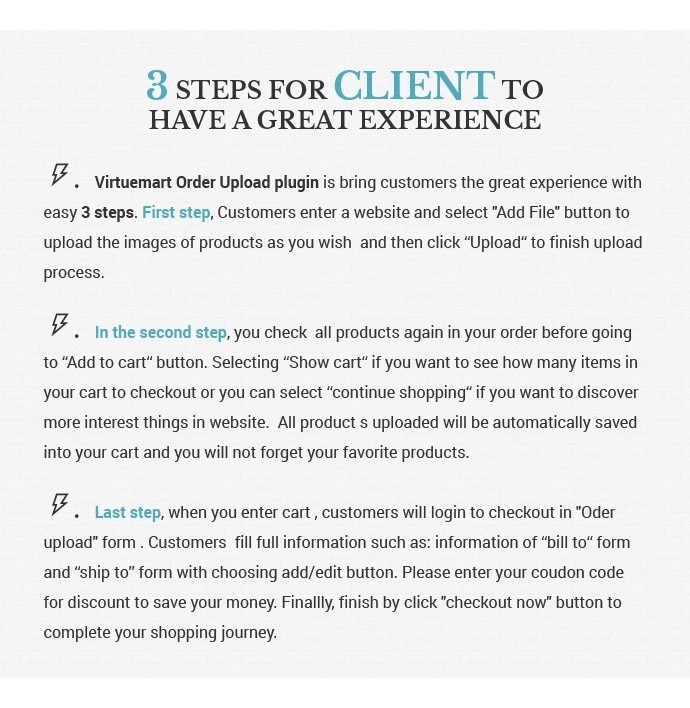 Virtuemart Order Upload plugin is bring customers the great experience with easy 3 steps. First step, Customers enter a website and select "Add File" button to upload the images of products as you wish and then click “Upload“ to finish upload process. In the second step, you check all products again in your order before going to “Add to cart” button. Selecting “Show cart” if you want to see how many items in your cart to checkout or you can select “continue shopping” if you want to discover more interest things in website. All product s uploaded will be automatically saved into your cart and you will not forget your favorite products. Last step, when you enter cart, customers will login to checkout in "Oder upload" form. Customers fill full information such as: information of “bill to “form and “ship to” form with choosing add/ edit button. Please enter your coupon code for discount to save your money. Finally, finish by click "checkout now "button to complete your shopping journey. Step 1: Enter Joomla administrator page and install this plugin by choosing Extension Manager in Extension category. Choose a file of this extension to upload and install file. Then choose Plugin Manager to enable plugins. Step 3: Virtuemart category -> Custom Fields. Filling full info of Custom Field Form: choose plugin on select box Custom Filed Type with title Order Upload Image, choose yes for cart attribute, cart input and in select plugin, choose VM Custom photo upload. Finally, choose "save and close". Step 4: Go to Virtuemart → Product and choose any product in “search Product” text box and go to the Related Categories Form to add created custom fields -> save. Click “Dress (ASD)" to view product in frontend. 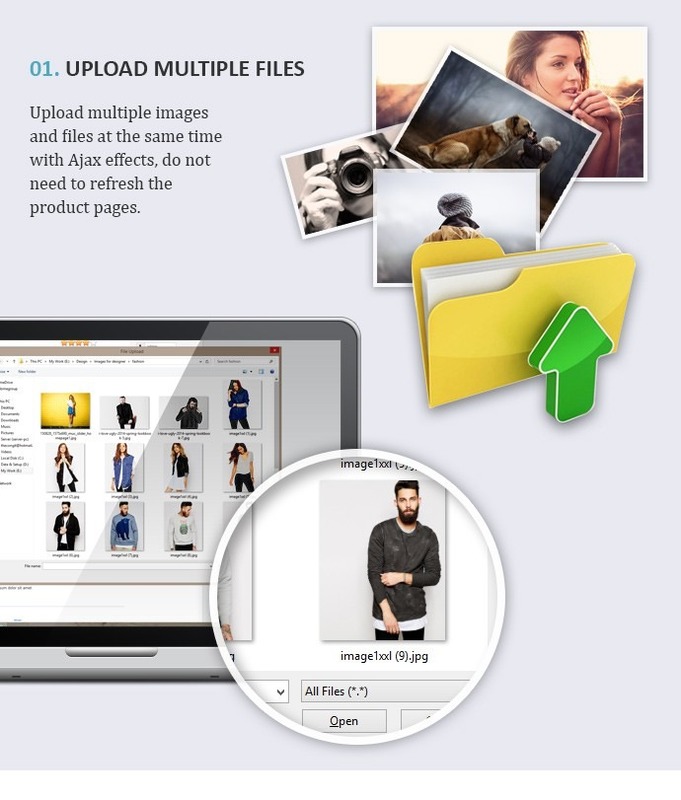 Support many files types: Shopper can upload images or any types of files into the product detail page. Images/Files Management: Images/ files are managed inside Virtuemart Order Management admin, and you will know which uploaded items belong to products for the same order/ same buyer. Easy to configure: Configure number of files to be uploaded. Configure maximize file size to be uploaded. Many thanks for your very efficvient and fast support !!! Best regards ! Good developers, good person, really good service! I could save a lot of time using to upload my files as well as product image after I bought your extension. Highly recommended! 5 stars! Very good plugin, with friendly and easy to customize Backend options, the extension is ideal for any websites. I'm very happy with the quality of products. 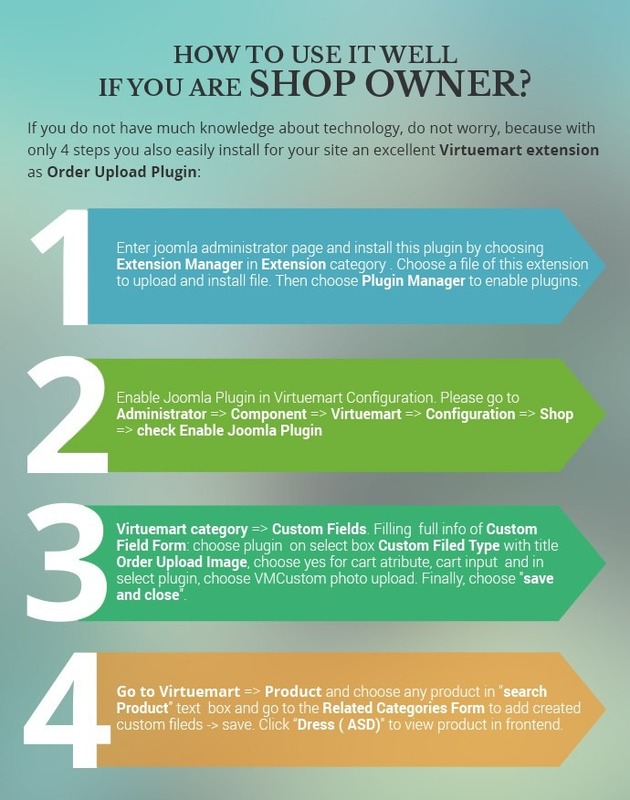 Virtuemart Order Upload Plugin is what you must -have extension in your site. Thank the developers. What an awesome plugin! Our website sells custom tees and bracelets and were going to pay someone BIG BUCKS to be able to upload photos for shirts or bracelets and now we can, so glad we found you guys! Superior support! You have my business forever! I required some modifications to the workings of the plugin, to which the developer completed perfectly and within a couple of days. I'd recommend this to anyone who requires an upload during checkout. Special thanks Huy BV (Technical Support) - for the prompt and professional assistance. Good luck to all participants of the project! perfect extension, and the customer service is amazing. A fantastic plugin. And the support is also Fantastic. For this I would give 10 stars but I can ! Great support and service. I immediately upgraded my order to more licenses due to the excellent service. Super plugin! One of the must have for a print shop like ours! Very good plugin. It help our customers send files to us quickly and easy. Fast service for support team! 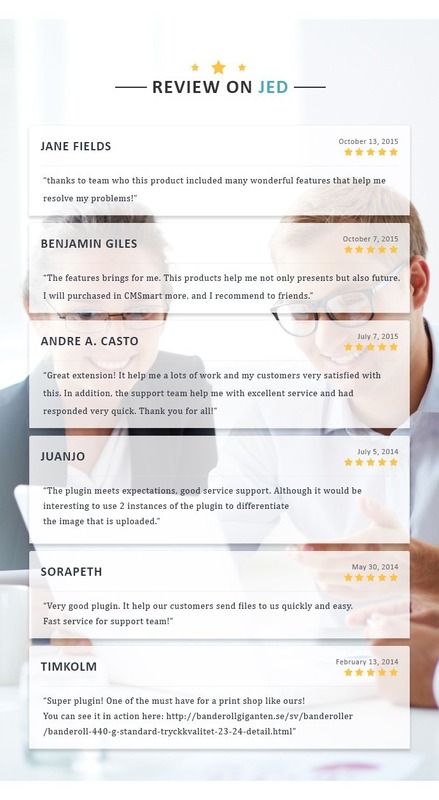 The plugin meets expectations, good service support. Although it would be interesting to use 2 instances of the plugin to differentiate the image that is uploaded. Great extension! It help me a lots of work and my customers very satisfied with this. In addition, the support team help me with excellent service and had responded very quick. Thank you for all! The features brings for me. This products help me not only presents but also future. 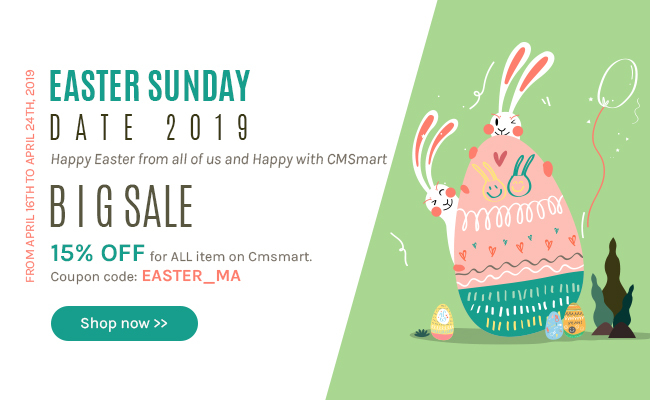 I will purchased in CMSmart more, and I recommend to friends. thanks to team who this product included many wonderful features that help me resolve my problems! Excellent products help us to save time and do other things, increase current income and future comfort. Many thanks Netbase. Now everything is easy, I can upload a lot of files and images, customers also got plenty of more. An extension should have in your website. This extension helps my customers save time, very friendly and easy to customize files. Your support is excellent. Thanks! Do I have to login on the site to upload files on my order? No, you don’t. It is one of the best convenient functions of this product that save a huge time of customers. Is this plugin compatible with Joomla 3.6.5 and Virtuemart 3.0.18.x? It is compatible with Joomla 3.6.5 and VM 3.0.18.x so don't worry about that. Can I edit or remove files on upload process? Yes, you can. Especially, it can be automatically created image files with thumbnails for products and it is also simple for users to configure maximum file size for uploading. What is the maximum file size a customer can upload? Where can I see some photos and\or a description of the administrative part of the expansion? You open the back-end and go to the detail order section. Yes, you can upload multiple images and files at the same time with Ajax effects; do not need to refresh the product pages. If I want to change the number of file when uploading, how will I do? You can easily configure number of files to be uploaded in the back-end. Configure maximize file size to be uploaded. Where can I manage the file? 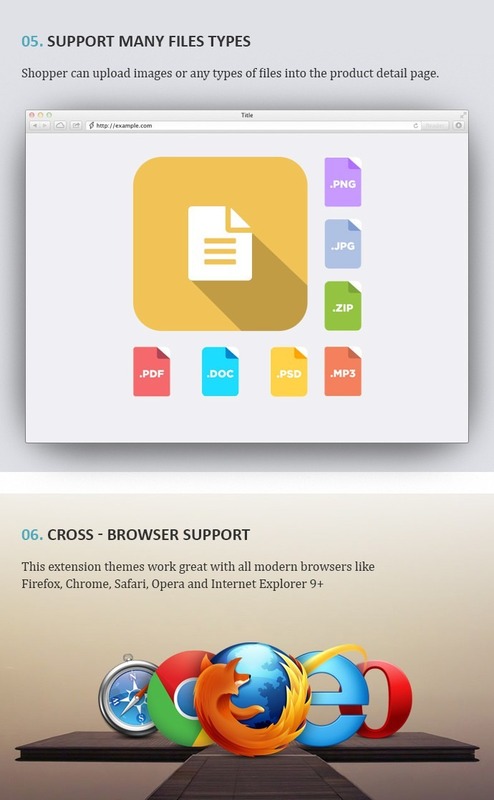 This extension supports many files as PNG, JPG, ZIP, MP3, PSD, DOC, and PDF. 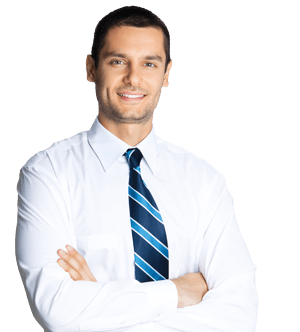 -Auto Renewal Payment: with this package, you have 6 months to receive our support, download and upgrade FREE. But, after 6 months you only pay a small recurring fee for each 6 months, you DON'T need to buy the product again. - Standard Payment: You only pay ONCE for this payment, you will receive our support, download and upgrade free in 6 months. But after 6 months, if you want to upgrade, download or support, you HAVE to buy again. Hello, I need an extension that will allow the client to upload pdf file when finalizing the order in VirtueMart 2.6.22. Will your plugin do the job? I would also like to ask is it possible to attach uploaded files to the email that is automatically send by Virtuemart to the shop owner after completing the checkout? If not will the shop administrator / owner recieve some kind of information that there is file that was uploaded by a client - in the email that is send to him after the checkout is done? I'm making a product customizator with breakdesign's product builder, however I would need your file upload option also. I tried another file upload plugin, but it was not working due to incompatibility and multiple issues with product builder. My question: If I buy your product, but cannot use it due to incompatibility, may I get a refund? I think it worth a try, but I don't want to risk the price if not working and I cannot use it on my website. Thanks, and waiting for your answer! Yes, we agree with your request in this case. different subproduct's photo in the single bundle product page? Many thanks for your interest in our product. I am Vincent from Customer Service Department at Cmsmart.net. It is my pleasure to support you in this case. What i wanted to achieve before i bought your item was that i could have this item as part of the addtocart form. Your plugin is just the same as the old one. What is the idea behind the onContentBeforeDisplay hook? This makes the plugin being showed in the bottom always. I am Vincent here. How are you today? Kindly create a ticket in which you provide your admin info, fpt and cpanel to get our Dev's support. If you have any questions more, feel free to contact me via Skype: Vincent@cmsmart.net for a quick response. i didn't clearly understand how works the plugin, could you please explain some things? Our website provide medical consultations (from the side of VirtueMart component the consultation is the item) and we need a possibility or method to upload files by customer on the checkout step. I don't see this field on your demo web-site: http://joxi.net/5mdk8JqtLz6Lr1 Where is it? Is it available only after login? Below is my answer for you. 1. No, our plugin don't works on the multiple checkout steps? 2. Yes, you need to login to see it. 3. Our product don't show in one page checkout extension. If you have any question, feel free to contact with me via my email: janet@cmsmart.net. I have your plugin for a while, but I accepted the english language too long, because I have no support anymore. But please tell me where can I translate the button texts as Ad files... Upload, Cancel, Delete. I cannot find the right file to do this. Thank you so much in advance. Thank you so much for your purchasing our product. You will translate your site. If you have any problem, feel free to contact with me. do you have a correct working demosite? The first you can upload and put in cart, but dont show the uploaded files. In the second demo it dont put the product in the cart. I need such a plugin but if it dont run correct on your site it probably dont run on my site. The demo does not show that you can charge additional fee for upload. There is a price icon display in configuration. Where is documentation? Default install does not display product upload buttons as demonstrated. No videos on YouTube to help - lack of documentation. No tool tips in back end to help with understanding options. With this extension , you can upload file and put into cart. File upload will show in page cart. On the demo did not show this (we will check again), but this product is allowed to upload file upload and display the cart page. Thanks for your quick reply Christina. I will recommend this to my partners. Hi again Christina. My colleague has been doing some tests with your demo page and has found the following problem. When we try to upload a psd file the uploader seems to be uploading but there is no image received. Currently as you test demo no received image but if you buy our products, our developer will custom free to you received image. So you totally rest assured to buy this products. Looking to hear your purchase. No problem, I'm happy when help you. Have a nice day! + Fixed Bug: Warning: JFolder: files: The path is not a directory. # Fix error that can’t create folder to save image in admin order. # Fix error that can’t save custom fields.